For the most discriminating computer users, Vu-Tek Circular Polarized filters offer the ultimate in glare control and contrast enhancement. Manufactured in our state-of-the-art cleanroom facilities, these filters feature some of the most advanced technology of its kind in the world. Circular Polarization is the most effective glare reducing technology in the world. Operating like a one-way light valve, Circular Polarizers allow light from your computer monitor to pass while eliminating about 99% of the glare from the surface of your the screen. Unlike some competitors, Polar Vision's unique manufacturing process sandwiches the polarizing technology between two layers of optical quality glass. This ensures that the polarizing layer is fully protected, allowing us to offer an exclusive lifetime warranty. Vu-Tek's Circular Polarizers are laminated using a process similar to that used in the manufacture of automotive windshields, providing impact protection and shatter resistance far exceeding that of "tempered" glass filters. Simply put, if you want the ultimate in safety, optical quality and vision enhancing performance, a Vu-Tek Circular Polarized filter is the only choice! It's A Completely Different "Glare-Blocking Technology." The glare returned through Vu-Tek Circular Polarized filters is less than 1/20th that of the tinted or shaded glass found other products! The unique "one-way light valve" property of Vu-Tek Circular Polarized filters allows most of your monitor's image light to pass through the filter for easier viewing...compare that to the dim darkened images produced by competitive products. Vu-Tek circular polarized filters can increase image contrast by as much as 43 to 1, which far exceeds the performance of the best dark tinted glass filters (at about 18 to 1) or the best light tinted glass filters (about 8 to 1). 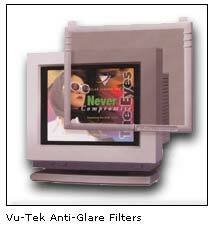 Vu-Tek offers a full line of conventional, high quality glass anti-glare/contrast enhancement filters. Contrast enhancement filters reduce glare by absorbing both inbound and the reflected light as it passes through the filter. Because contrast enhancement filters also affect the amount of light that reaches you from your computer monitor, it is important to select a filter with a level of absorption that provides the right compromise for your viewing situation. We advise you discuss your application with your ErgoDynamics-Vu-Tek sales professional. Call 732-275-1400 for more information. With a 15 year reputation for the highest optical quality and the most advanced technical performance, Vu-Tek filters are widely respected by computer users and anti-glare professionals worldwide. For use when glare is most severe! A good compromise between glare reduction and image brightness! Mild glare reduction with optimal image brightness! A special view angle control layer in the Vu-Tek Privacy filter provides privacy and security from unwanted viewers, yet allows you to view your monitor clearly. Vu-Tek privacy filters are ideal for public data entry terminals such as those used in banking, securities brokerages or other public locations where privacy is of utmost importance. An invisible transparent conductive coating on the surface of the filter provides an effective barrier to "e-field" radiation generated by most CRT computer monitors. In addition, the grounded conductive coating prevents the build-up of static electricity on the filter surface reducing the tendency to attract dust and dirt. This ensures that your Vu-Tek filters stays clean and clear. This conductive shielding option is available on nearly all Vu-Tek filters. Our most popular flat-frame style offers a unique curved back, shutting out unwanted light, thus increasing contrast. This superior frame solution sets the standard for filters attached to the front of monitors. Available in four sizes to cover 14"-21" monitors. Wraps elegantly around the monitor, shutting out all light and dust. The Vu-Tek Contour Frame is built with rigid, unbreakable plastic and sonic welding to ensure a lifetime of continuous use and superior styling. Available in four sizes to cover 14"-21" monitors. The top of the Vu-Tek line. Made of a unique, flexible rubber-like material, the Medallion's innovative wrap-around design helps set it apart from its competition. Available in eleven sizes, this peerless frame is unlike any other on the market. Capable of fitting the monitor like a glove - yet flexible enough to allow a more custom fit than rigid plastic models - the Medallion is the ultimate in ergonomic vision care frames. A high-quality basic solution in a universal flat frame. Easily transfers from one monitor to another in the common 14/15 inch sizes. Snap-On hangers make it easy to adjust to a perfect fit.